All of Rhode Island and Southern Mass. and Eastern Conn. Contact me if you are outside my area to discuss travelI will need permission to search on private property by the land owner. I work on a Reward Basis that's means you pay what its worth to you and what you can afford to have me find your lost ring.....20% of all the money goes to charity...The Make-A-Wish Foundation of Rhode Island. And that I have a call out fee for some Areas if the ring not found to cover fuel expenses....We can discuss this when you call. I can search... Beaches, parks, lakes, and yards. I have underwater detectors and can search up to 4 1/2 feet of water. 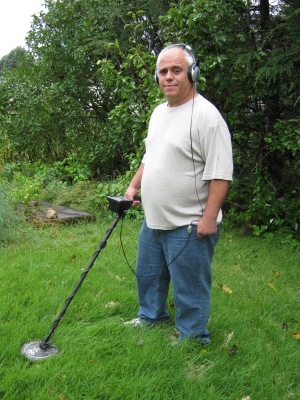 I first became interested in metal detecting while vacationing on Cape Cod. Since that time, it has become a fun hobby. I've found coins, jewelry, toys, etc., all while getting lots of exercise. I'd love to help you find that special lost item! Let me first start off by thanking you for finding my ring. This ring means more to me than the appraised value as it represents not only The Citadel but also the hard work and perseverance that was needed to while attending the school. When I first lost the ring I thought it was forever lost. Your professionalism and understanding of the situation eloped ease some of the anxiety of still not having my ring after hours of searching. There are very few people who go out of their way to help others but you changed your daily routine and came down to help on the same day. 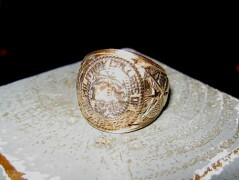 I can't thank you enough for your help and your professionalism throughout this process of finding my ring. When I was in college, I went to school in Europe for one summer. My grandmother loved Paris very much. Before I left, she gave me a generous check and told me to buy a wonderful souvenir in Paris, so that I could always remember my time there. I bought a gold trinity ring at Cartier. It rolled on to my finger, and I loved it. During those few days in Paris, I actually was introduced to my future husband, Lane. I have always treasured that ring…a gift from my grandmother, and a ring that has been on my hand since I met my husband almost 22 years ago. A couple of weeks ago, our family…which now includes 3 children, headed to the beach in California for our summer vacation. We had a wonderful time playing in the ocean, sea kayaking, and really just spending time together without all the distractions of home. My youngest, Cole, just threw an amazing pass. As I reached up to make the catch, I heard the clinking of my ring as is rolled off of my finger and flew in air. I told him to hang-on, I had to get my ring. As our family stared into the sand, expecting to see the sun’s reflection off of my ring, we only saw a sea of sand. Everywhere we looked, looked the same. And my ring was nowhere. We sifted through the sand for over an hour and then the tide began to rise, and the waves washed away my hopes of finding my ring. As we walked out on the beach for the days to come, I would pray that the Lord would somehow let my ring appear. It never did. We left California almost 5 days later. After we got home, I missed the familiar ring on my finger even more. Lane could sense my disappointment. It is funny how even simple things can be so meaning-filled. When I walked downstairs to tell Lane goodnight, he had a website pulled up on the screen of the computer. “TheRingFinders.com”, it said. He told me to call that number. It was 10:30pm, and I was clicking on “The United States,” “California,” “Ventura County,” and there it was, a name and phone number of a “ring-finder expert.” He answered right away and was simply distraught that he couldn’t help me. He was on a 3 week vacation, and he said that would be too long to wait. He told me to call someone from another county. “They’ll drive up,” he said. And so I clicked on “Los Angeles,” over an hour’s drive from our beach house in Oxnard. Jim answered the phone. In my own disbelief that I was making this call, I explained to this man the story of my lost ring. Jim said, “Oh, I’ll go look for your ring.” “You will?” “Oh yes, I’ll go look.” “Well, how much do you charge to look,” I said. “Well, it’s going to be a bit of a drive, so I would ask that you pay for my gas.” “That’s fine,” I said. “If I don’t find your ring, than that is the only charge.” “Really?” “Yes, but if I do find your ring, you don’t have to pay for gas, and you can just pay me whatever you think is fair.” “Really? !” I couldn’t believe what he was saying. “When do you think you could go look?” “Well, I’ll go tomorrow,” he said. “You can go tomorrow?” “Yes, I will go look for your ring tomorrow,” he promised. Lane is very detailed and thorough. He sent Jim a Google Earth beach-side image of our house told him that he had paced off 63 steps from the back deck to where we thought the ring was lost. I sent him a picture of the ring. At 11:00pm Jim emailed to find out the time of day that I lost the ring. He had already checked the tidal pattern and wasn’t sure if he could make the 4:00am low tide. I told him that was okay. I did tell him that he should wear a cape---since he was off to save the day---and that I would be praying for him.